The Hydros Bottle is the first everyday filtering water bottle. Get 24 oz of refreshing great tasting water on the go and revitalize your body and the planet we live on. For best results, be sure to replace your filter every 3 months (150 uses). Hydros Bottle™ holds more than water. It is a chance to help the nearly 1 billion people who do not have access to clean drinking water. With your purchase, you have joined the fight against the Global Water Crisis. We are reinvesting profits today into developing new filter technologies so tomorrow an even better Hydros Bottle can bring clean water to people in need globally. In the meantime, $1 from each Hydros Bottle will go towards a water infrastructure project designed to be socially, economically, and environmentally viable. Such sustainable development projects meet the needs of people today without compromising those of tomorrow. For our first project, Hydros Bottle has partnered with the Engineers Without Borders USA to deliver fresh water to the village of Gundom. Don't you just love a company with a mission and that's out to do something really great? Well Hydros is one of those companies! We frequently take our reusable water bottles with us when we're going out for the day, or on a long car trip. Knowing that it's much better for the environment, and that it's easier on the wallet than buying bottled water; we've been using reusable water bottles for quite some time now. However, the Hydros Bottle isn't just any reusable water bottle! To start with, it's BPA FREE; which now is an absolute must for me knowing the dangers that BPA can pose to our health. 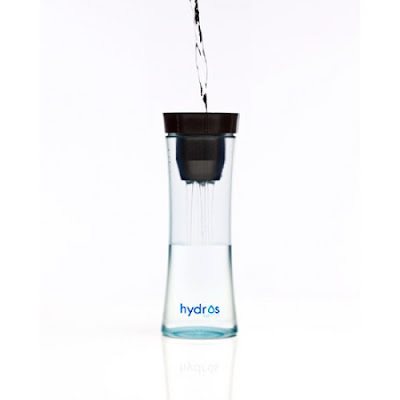 The Hydros Bottle also filter's water for you while your on the go! I can't tell you how many times we've been out and about, and we've finished all of the water in our reusable bottles. Now with the Hydros Bottle we can fill it up while we're out and know that the water that we're all drinking is clean and safe. I love how convenient and cost effective the Hydros Bottle is, and it's great to know that Hydros is giving back through Operation Hydros......Helping to fight the Global Water Crisis! You can keep up with all of the latest happenings at Hydros on FACEBOOK. I want one! Actually two! Your newest follower from mbc!